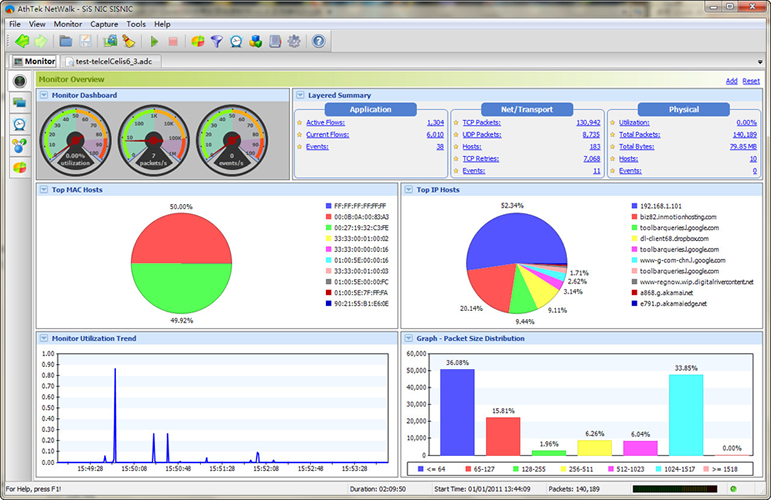 Free AthTek NetWalk Home Edition is the ONLY professional free packet sniffing and network monitoring software for home network management. Even you are not so familiar with network management knowledge, you can still easily handle it with the graphic interface. Most of the key items in network management have been preset as default main instrument panel for you can easily know the network status at first glance. In the new edition it includes Wireshark for better traffic analysis performance. and most important of all, it is still totally free for use. AthTek NetWalk has a flexible graphic interface which is very straightforward for you to understand the network status. It enables you to trace route from those charts to the traffic source as interactive navigations. It support almost all kinds of network protocols even the IPv6, what is other not supported by other packet sniffing tools. Built-in traffic filter models enables you to easily identify intrusions and cut off them from access. If you have no idea about those elusive traffic data in packet sniffing, it doesnÃ¢â‚¬â„¢t matter. AthTek NetWalk will convert the traffic data into traffic map for you, and you are able to know all the communication details with the communication path diagrams. AthTek NetWalk is the ideal network management software for your home network security. In the new free personal edition, AthTek NetWalk includes following features, but not limited to them: * Intelligent navigation; * Enhance packet sniffing on all protocols; * Add many built-in rules in filter, like MSN, Yahoo messenger; * Completely support IPv6; * Support traffic analyzing while packet sniffing; * Integrate Wireshark and perform better than Wireshark. With the complete collection of interactive charts, network administrators can freely track traffic source from any kinds of network for information analysis purposes. Most important of all, AthTek NetWalk is still totally free for family use. This site does not contain serial number, crack, keygen AthTek NetWalk Free Edition serial number : serial number is the simplest type of crack. A serial number(cdkey,product key,etc) is register the program as you may already know. a crack or keygen may contain harmful software. If you cannot find the exact version you want, just give it a try. for more information read .nfo/.txt/.diz file include in zipped file.